Entrepreneurship is aptly defined as the unity of the power of ideas, as built upon the foundation of Filipino ingenuity, resourcefulness and resiliency. Filtrepreneur Franchise, Inc. (FFI) was established with the primary purpose of tapping into the entrepreneurial spirit that we believe lies in most Filipinos aiming to succeed in a business venture. The current economic trend has placed a new focus on how to generate more "job creators" in our economic system, and has made the idea of a global celebration of entrepreneurship as a path to positive growth especially relevant. The Filipino Dream embodies the value of innovation as a breeding ground of job creation through the promotion of entrepreneurship. Guiding our business model is the goal of giving business to every Juan. 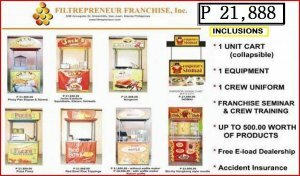 To be recognized and respected as the most successful franchise network marketing company in the Philippines. FFI is committed to uplifting the lives of every Filipino by providing totally reliable and competitively superior products, empowering him with the business knowledge to become a successful business owner by fostering customer enthusiasm through the integration of people, technology and business systems.